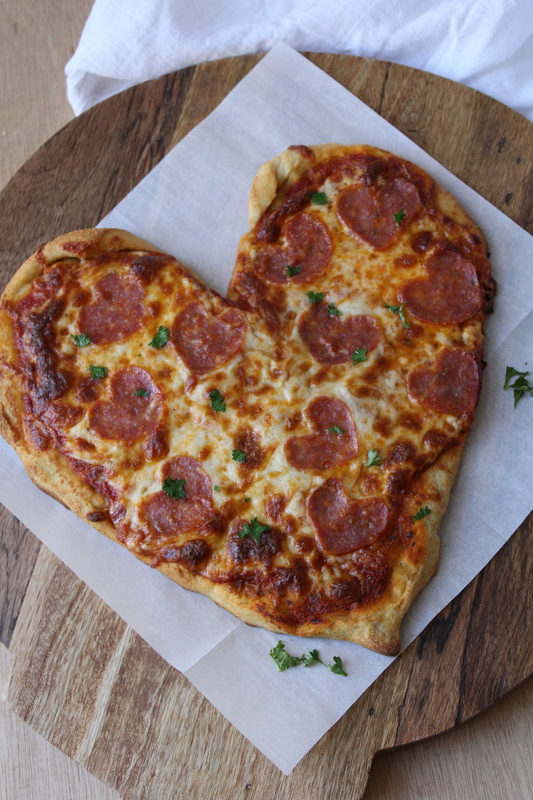 Make this special Valentine’s Day pizza with your honey, your kids, your friends, family or just for yourself too! It is an easy, inexpensive and fun dish to make together. Last year on Valentine’s Day, Tommy and I were both sick so we stayed home and made this pizza together. I knew this year I had to share it with you guys because it is just so dang easy and cute. I hope you have fun with this recipe. PS- it is definitely okay to have left over heart shaped pizza for breakfast the day after Valentine’s Day, no one will ever know! 1 Pack Premade Pizza Dough, about 16 oz. 1. Preheat oven to 475 degrees. Remove dough from the refrigerator and let it sit at room temperature for about 20 minutes. While the dough is resting grate the mozzarella and cut the pepperoni into heart shapes. You can easily cut hearts by folding a pepperoni in half and using kitchen scissors to cut out a half heart shape on the folded side. 2. Lightly flour work surface. Place dough on work surface and stretch the dough by hand and with a rolling pin. Roll the dough into a large round to the thickness desired. You want at least a 10-12 inch round. You can make it larger if you want a thinner crust. 3. Lightly oil your baking sheet or pizza pan. Once the dough is the desired size, transfer it onto your oiled baking sheet or pizza pan. Use a sharp knife or a pizza cutter to cut out a heart shape. Start at the top and try to cut as little dough off as possible. After cutting use your hands to stretch the dough into the best heart shape you can. Remember it’s homemade so it does not have to look perfect! Fold over the edges of the dough to make a small crust. 4. Next, drizzle olive oil onto the entire surface of the pizza dough including the crust. Sprinkle garlic powder on the entire surface of the dough and crust as well. Add as much sauce to the pizza dough as desired then top with cheese and pepperoni. 5. Bake the pizza for 10-15 minutes or until the cheese is melted and bubbly and the crust is golden brown on the bottom. Remove from the oven, slice and top with fresh chopped parsley if wanted. • If you don’t have a rolling pin, use a bottle of wine or a large glass to roll out your dough. • The pepperoni will shrink when baked, so add extra if you like lots of pepperoni. • I bought all of my ingredients including three packs of dough at Trader Joe’s for about $12 total. That comes out to only about $4 a pizza! • I only used 1 pack of dough and froze the rest. You can easily thaw it out when needed. Yay!!!! That makes me happy… Enjoy!!! That’s a great idea for a lovely V-day meal! Thank you so much, Lynna! Pizza is also the way to my heart lol!!! Have a great Valentine’s Day as well! Thank you for stopping by! Ok, I think I have found my “sister blog”. 😉 Love your recipes. And this one is just so cute! I see that I have a lot of browsing to do. Love it!